Jose Angel Medina “Pepe”, 52, passed away on Thursday, August 27, 2015 at the Serenity House in Santa Barbara, California, after a long battle with cancer. Joe was a Santa Barbara native and was born on December 26, 1962. He attended Franklin Elementary School, Santa Barbara Junior High and Santa Barbara High School. Joe worked in construction all his life and was known for his talented work in his trade. He was a multi-talented artist and was known for his beautiful artwork, which was his passion throughout his life. In the end he left his drawings, rock sculptures, and wood carvings to his family and friends, which will be treasured forever. His other interest was photography; one of the things he liked to do was to go to the Dons football, soccer and basketball games and take pictures of the games, family and friends. His other joys in life were camping, fishing and having barbeques with family and friends. Joe had a great sense of humor and always made us laugh. He was always there for his niece and nephews; giving them guidance, support and encouragement. He had many friends throughout the community and very close friends from childhood that he grew up with from the eastside of Santa Barbara. He touched many people throughout his life and he will be missed by everyone. 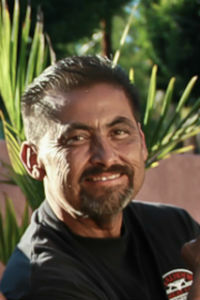 Joe is survived by his father, Jose Carmen Medina, his brother Steve (Lisa), his sisters Lupe (Miguel) and Esperanza Sierra. Nephews; Robert, Joseph, Michael, Matthew, Cody and niece Marissa. He is predeceased by his Mother Ofelia C. Medina. Memorial will be on Saturday, September 12, 2015 at 12 noon at the Calvary Chapel, 1 N. Calle Cesar Chavez # 21, Santa Barbara, Ca. 93103 and the reception will follow at Tucker’s Grove Area 1. The family would like to express sincere gratitude to everyone who was there for him towards the end of his life and a special thank you to the staff from the Cancer Center of Santa Barbara, Visiting Nurses and Hospice Care and Serenity House for being there for our beloved son, brother, brother-in-law, uncle and friend. In lieu of flowers please donate to Joe’s Memorial.